Off-Topic: SO stoked for the Walking Dead premiere! I am so stoked for the premiere of The Walking Dead this Sunday on AMC! Ever since I first heard about this happening -- what, a year ago? -- and saw the trailer leaked from Comic-Con I've been counting the days. And now the count is down to two. I'm a strong proponent of the slow zombie genre. None of that running crap. For me, the zombie story is not about scary monsters -- it's about a force of nature, a slow wave of catastrophe that, unleashed, relentlessly and unstoppably lurches and seeps into every corner of human life. 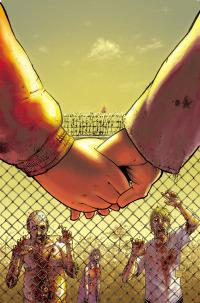 I love the old Romero movies, and I really liked Max Brooks' books World War Z and the Zombie Survival Guide, but for me the pinnacle of zombiedom is Robert Kirkman's Walking Dead comic book series. It's like he starts the story where most other stories leave off -- and then runs with it, and runs with it, and keeps on running. The characters are so good, so noble and damaged... I don't know, I could go on. Anyway if you haven't heard of it and you like zombies (who doesn't these days?) then you should pick up the comics. And I'm keeping my fingers crossed for the show to be good. One side note to any newcomers to the Walking Dead who happen to see the premiere: The one thing -- the ONE THING -- that is kind of lame in the entire story happens right at the start. It basically starts excactly the same way as 28 Days Later. But don't let that bug you -- it's over quick, and it quickly goes off in its own direction and gets so, soooo good. This fanboy rant brought to you by Matt, by the way. Ralf doesn't care. But maybe he will if he ever experiences the awesomeness. OK, I'm giving that first episode a "good" but not "blow my socks off great." They've nailed the desolate post-Zombiepocalypse atmosphere, and the acting was pretty solid. But we'll have to wait til Rick is reunited with his family and meets the rest of the survivors to judge whether AMC is going to deliver on the most important aspect of the series: the interpersonal relationships.